Caps and gowns: Penn State Geography class of 2018 (with department staff Melissa Weaver and Jodi Vender, front) at the Pegula Ice Arena on May 4 for the College of Earth and Mineral Sciences Commencement. 2018 Ice Cream Social and United Way Basket Raffle will take place on June 20 in the courtyard at Walker Building. We will begin scooping ice cream at 1:00 p.m.
Justine Blanford was elected to serve as a director for the University Consortium of Geographic Information Science (UCGIS) and also one of the inaugural TRELIS fellows, selected from a group of her peers to participate in a new UCGIS initiative focused on the professional development of women in our academic discipline. Tim Yuskavage (’11) received his Master of Arts from the Security Studies Program at Georgetown University in May 2018. He continues to work for the US Government as an analyst. One more grad rep has been elected: Jade Huang. Scott Pezanowski, a doctoral candidate in the College of Information Sciences and Technology, has received the NASA Space Grant Graduate Fellowship given by the Pennsylvania Space Grant Consortium for 2018-2019. The mission of the program is to expand opportunities for Pennsylvanians to learn about and participate in NASA’s aeronautics and space programs by supporting and enhancing science, technology, engineering and mathematics (STEM) education, research and outreach programs. The one-year fellowship consists of a $5,000 monetary award, presented to outstanding graduate students pursuing degrees in STEM fields related to NASA research and development. The Review Forum on Abdi Samatar’s book Africa’s First Democrats ( Samatar, 2016) arose from initial conversations at the Royal Geographical Society with IBG Annual conference in 2017. Under the umbrella theme of Decolonising Geographical Knowledges, Abdi Samatar and Joshua Inwood discussed the book and its wider relevance for the field of political geography. This review forum continues the conversations begun there, with an additional two commentators and Samatar’s response. As a conversation between black and white geographers, between political geographers of diverse theoretical and substantive interests, and as a conversation about the methods, frames and frameworks through which we come to understand power and geography, this Review Forum seeks to be a space for practices of decolonising geography. Decolonisation carries multiple meanings yet crucially points to efforts to both identify and challenge the dispositions of power whose origins and hegemony lie rooted in colonialism. Decolonisation becomes an issue of concern for geography as power relations in the colonial present permeate knowledge and ways of producing knowledge; “knowledge production and everyday relations are informed by European colonial modalities of power and propped up by imperial geopolitics and economic arrangements” (Collard, Dempsey, & Sundberg, 2015, p. 323; Radcliffe, 2017). Going beyond postcolonial analysis, decolonisation encourages re-thinking the world from Africa, from Latin America, from Indigenous places, and from marginalized academia ( Grosfoguel, 2012). This chapter describes our experiences in connecting a group of emerging Southern African scholars around the inherently interdisciplinary field of migration, urbanisation and health. South Africa, as with other countries in the region, is witnessing multiple simultaneous and interconnected transitions – health, demographic, social, economic and political. Defining, measuring and better understanding the dynamics and complexities of these transitions is a fundamental step in the professionalizing of next-generation scholars in the area of migration, urbanisation and health. In this chapter we discuss themes, definitions and the process of forming group discourse at the nexus of migration, urbanisation and health. Driven by substantive questions derived from studies of the lived experiences of urban migrants in South Africa, specifically the intertwining of migration trajectories and health histories, a central goal of our collaborative endeavour was ‘to connect the dots’ – key concepts, data, measures and methods – in order to identify common themes and research priorities that will facilitate the participation of next-generation scholars in developing innovative and new research agendas. We report on the themes that emerged from a 2015 workshop held at the University of the Witwatersrand in Johannesburg that brought together senior and early-career scholars to discuss ways of engaging with migration, urbanisation and health in the Southern African context. We close with a discussion of the opportunities and challenges for early-career scholars in this field, identifying next steps to develop and sustain in-country capacity to influence both research and public policy. A methodology is presented to calibrate contributed Safecast dose rate measurements acquired between 2011 and 2016 in the Fukushima prefecture of Japan. The Safecast data are calibrated using observations acquired by the U.S. Department of Energy at the time of the 2011 Fukushima Daiichi power plant nuclear accident. The methodology performs a series of interpolations between the U.S. government and contributed datasets at specific temporal windows and at corresponding spatial locations. The coefficients found for all the different temporal windows are aggregated and interpolated using quadratic regressions to generate a time dependent calibration function. Normal background radiation, decay rates, and missing values are taken into account during the analysis. Results show that the standard Safecast static transformation function overestimates the official measurements because it fails to capture the presence of two different Cesium isotopes and their changing magnitudes with time. A model is created to predict the ratio of the isotopes from the time of the accident through 2020. The proposed time dependent calibration takes into account this Cesium isotopes ratio, and it is shown to reduce the error between U.S. government and contributed data. The proposed calibration is needed through 2020, after which date the errors introduced by ignoring the presence of different isotopes will become negligible. 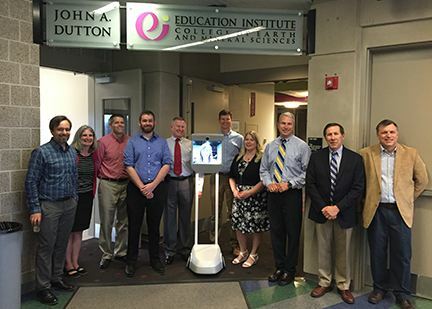 Faculty, advisers and students—one participating virtually via robot—in the online geospatial programs celebrate commencement at a reception held by the Dutton e-Education Institute on Sunday, May 6. Pictured from left: Anthony Robinson, Justine Blanford, Jim Detwiler, Anthony Scavone, Ric Stamm, Jessica Story Noonan (robot), Ryan Baxter, Danielle Groff, Dan Steiner, Todd Bacastow, Greg Thomas. Erica Smithwick has been promoted to professor. Chris Fowler has been promoted to associate professor. Julie Sanchez won the best student paper award of the Polar Geography Specialty Group at the 2018 AAG annual meeting in New Orleans. This project is through ChoroPhronensis, a research unit in Penn State’s Department of Geography founded by Alexander Klippel, professor of geography. Klippel’s research focuses on immersive technologies and spatial information theory. The following is a list of academic promotions for tenured and tenure-line faculty members at Penn State, effective July 1. The rains had just begun in Huánuco in central Peru when we arrived in early February 2016. This time of year is usually midway through the roughly six-month rainy season that stretches from October to May. Instead, the unseasonal heat and months of drought that year were a shock to people in Huánuco—and to us. Only a week or two earlier, we were told, the landscape of the Húanuco valley had resembled the drab brown of the height of the dry season. We had just begun a project focused on biodiversity (agrobiodiversity) in the food landscapes of indigenous small landholders, as well as on their dietary patterns amid dynamic changes in the environment and society. We’re a diverse team of faculty, scientists, field practitioners and students from multiple institutions. The two main methods for determining the average daily near-surface air temperature, twice-daily averaging (i.e., [Tmax+Tmin]/2) and hourly averaging (i.e., the average of 24 hourly temperature measurements), typically show differences associated with the asymmetry of the daily temperature curve. To quantify the relative influence of several land surface and atmosphere variables on the two temperature averaging methods, we correlate data for 215 weather stations across the Contiguous United States (CONUS) for the period 1981–2010 with the differences between the two temperature-averaging methods. The variables are land use-land cover (LULC) type, soil moisture, snow cover, cloud cover, atmospheric moisture (i.e., specific humidity, dew point temperature), and precipitation. Multiple linear regression models explain the spatial and monthly variations in the difference between the two temperature-averaging methods. We find statistically significant correlations between both the land surface and atmosphere variables studied with the difference between temperature-averaging methods, especially for the extreme (i.e., summer, winter) seasons (adjusted R² > 0.50). Models considering stations with certain LULC types, particularly forest and developed land, have adjusted R² values > 0.70, indicating that both surface and atmosphere variables control the daily temperature curve and its asymmetry. This study improves our understanding of the role of surface and near-surface conditions in modifying thermal climates of the CONUS for a wide range of environments, and their likely importance as anthropogenic forcings—notably LULC changes and greenhouse gas emissions— continues. Jianguo Liu, Yue Dou, Mateus Batistella, Edward Challies, Thomas Connor,Cecilie Friis, James DA Millington, Esther Parish, Chelsie L Romulo, Ramon Felipe Bicudo Silva, Heather Triezenberg, Hongbo Yang, Zhiqiang Zhao, Karl S Zimmerer, Falk Huettmann, Michael L Treglia, Zeenatul Basher, Min Gon Chung, … Jing Sun. The world has become increasingly telecoupled through distant flows of information, energy, people, organisms, goods, and matter. Recent advances suggest that telecouplings such as trade and species invasion often generate spillover systems with profound effects. To untangle spillover complexity, we make the first attempt to develop a typology of spillover systems based on six criteria: flows from and to sending and receiving systems, distances from sending and receiving systems, types of spillover effects, sizes of spillover systems, roles of agents in spillover systems, and the origin of spillover systems. Furthermore, we highlight a portfolio of qualitative and quantitative methods for detecting the often-overlooked spillover systems. To effectively govern spillover systems for global sustainability, we propose an overall goal (minimize negative and maximize positive spillover effects) and three general principles (fairness, responsibility, and capability). Exploring invasibility with species distribution modeling: How does fire promote cheatgrass (Bromus tectorum) invasion within lower montane forests? Peeler, J.L. and Smithwick, E.A.H. Cheatgrass (Bromus tectorum) is notorious for creating positive feedbacks that facilitate vegetation type conversion within sagebrush steppe ecosystems in the western United States. Similar dynamics may exist in adjacent lower montane forest. However, fire‐forest‐cheatgrass dynamics have not been examined. We used species distribution modeling to answer three questions about fire and invasibility in lower montane forests: (Q1) Does fire create more suitable habitat for cheatgrass? (Q2) If so, which site attributes are altered to increase site suitability? (Q3) Does fire increase connectivity among suitable habitat and enhance spread? Healthcare access and utilization remain key challenges in the Global South. South Africa represents this given that more than twenty years after the advent of democratic elections, the national government continues to confront historical systems of spatial manipulation that generated inequities in healthcare access. While the country has made significant advancements, governmental agencies have mirrored international strategies of healthcare decentralization and focused on local provision of primary care to increase healthcare access. In this paper, we show the significance of place in shaping access and health experiences for rural populations. Using data from a structured household survey, focus group discussions, qualitative interviews, and clinic data conducted in northeast South Africa from 2013 to 2016, we argue that decentralization fails to resolve the uneven landscapes of healthcare in the contemporary period. This is evidenced by the continued variability across the study area in terms of government-sponsored healthcare, and constraints in the clinics in terms of staffing, privacy, and patient loads, all of which challenge the access-related assumptions of healthcare decentralization.